PT Jasa Raharja (Persero) - Jasa Raharja is the largest social insurance companies in Indonesia with core business competencies in accident insurance. Jasa Raharja is a non listed state-owned company and all shares of the Company (100%) owned by the Government of Indonesia. Based in Jakarta, Jasa Raharja runs its business through 29 branches, 62 representative offices, 62 service offices (KPJR) throughout Indonesia. The Company's head office is registered at Jl HR Rasuna Said Kav C-2, Kuningan Jakarta Selatan 12920. PT Jasa Raharja (Persero) has 1 subsidiary, namely PT Jasaraharja Putera which focus on general insurance and surety bond guarantee business. Maximum age of 27 years old (Max 27th birthday on 18 March 2017). Minimum holds Bachelor Degree/S1 from a leading university (PTN/PTS), preferably majoring in Accounting, Actuarial, Insurance, Finance, Law, Psychology, Risk Management, IT, Economics Management, Mathematics / MIPA, Architectural Engineering and Civil Engineering. Strong academic record with minimum GPA of 2.75 (for PTN) or 3.00 on a 4.00 grade scale (for PTS). Morale and able to work in teams. Does not have a Parent and / or Siblings who are still actively working on Jasa Raharja (as evidenced by the statement letter, signed on stamp duty). Willing to be stationed in all over Indonesia (as evidenced by the statement letter, signed on stamp duty). JobsCDC.com now available on android device. Download now on Google Play here. Please be aware of recruitment fraud. The entire stage of this selection process is free of charge. 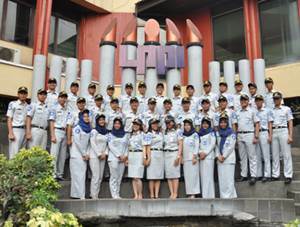 PT Jasa Raharja (Persero) - Fresh Graduate Program Jasa Raharja March 2017 will never ask for fees or upfront payments for any purposes during the recruitment process such as transportation and accommodation.